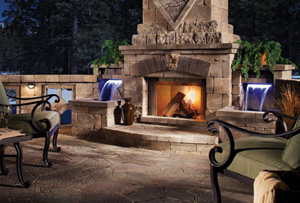 Landscape Magic has been creating and installing custom outdoor kitchens and barbeques for Arizonan families for years. We are proud to transform the outdoor living spaces of most homeowners in Arizona by providing them with innovative outdoor kitchen design and quality outdoor kitchen installation. So if you love to entertain and cook for your family and friends in a unique and excellent way, ask Landscape Magic to equip your outdoor living space with a custom outdoor kitchen and barbeques. Every outdoor kitchen design varies. Every outdoor kitchen installation is built differently. Aside from the many available options on how to build custom outdoor kitchens and barbeques, every contractor follows certain standards in building the structure and base of custom outdoor kitchens and barbeques. With this, it is very important for you to look for a contractor who can provide the kind of outdoor kitchen design you want. 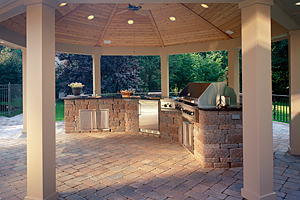 Take note that the construction of outdoor kitchens and barbeques involve a complex process. Hence, the contractor should have the capability to carry out the project properly. The two things you should consider in looking for a qualified contractor are their knowledge in creating novel outdoor kitchen design and their experience in performing outdoor kitchen installation. They should have a decent background in working on this project and the reliability in building a fully functional outdoor kitchen. Also, a contractor should be able to provide their clients sound advice in selecting the most ideal materials and detailed cost estimates. An outdoor kitchen installation may require you a big investment, so be sure to get a professional and reliable contractor. Do you want your family and friends to experience and enjoy the outdoor living space? If yes, then Landscape Magic is the right contractor you should choose to create an outdoor kitchen design and to work on your outdoor kitchen installation. Our company is a reputable contractor in the state of Arizona for building custom outdoor kitchens and barbeques that transform an ordinary backyard into an amazing relaxation destination. Landscape Magic ensures that every design and installation of outdoor kitchens will be distinct for every client. The designs and materials we use conform to the personal preferences of our clients. And since our company is composed of knowledgeable and well experienced professionals, our clients are also assured that the outdoor kitchen we create will match to the overall theme of their landscape. Moreover, the custom outdoor kitchens and barbeques our company builds can also be equipped with other accessories to complete the outdoor living experience of our clients. These include the addition of bars, dining areas, refrigerators, working tables, and many more. We also build customized roofing to secure the comfort and enjoyment of our clients while cooking and bonding with family and friends no matter what the weather is. Arizona is one of the few states in the country that has a climate suited for outdoor activities all throughout the year. So building an outdoor kitchen and barbeque in your property is becoming a necessity. Call Landscape Magic now and be one of our many satisfied clients.